Mark your calendar guys — you’ll want to tune in to Kelly McMillan’s Taking Stock Radio Show this Friday, August 11, 2017. The broadcast will feature Ian Kelbly of Kelbly’s, one of the leading purveyors of custom actions and precision match rifles. Ian Kelbly knew he’d end up in the firearms industry when he was seven years old and wanted to be like his Grandfather, who started Kelbly’s in 1981 in North Lawrence, Ohio. Over 50 world records have been set with Kelbly’s products in just the last ten years. On the radio show, Ian will talk about new Kelbly actions, and Kelbly’s new products for PRS and other tactical competitions. Kelbly’s is one of the founding sponsors of the National Rifle League, a new non-profit organization that is offering an alternative to PRS. Eight major NRL matches will be held this year. Along with Ian Kelbly, Kelly McMillan will also interview Nick ‘Beard’ Owens of Owens Armory. Once Nick started building rifles, word of mouth led to Owens Armory being established. As the business grew, Nick’s buddy Felipe Tomas Meraz came to Arizona to join the team. Owens and Meraz, a PRS competitor who also recently attended the King of 2 Miles (K02M) event in Raton, NM, will talk about Extreme Long Range and K02M competition. 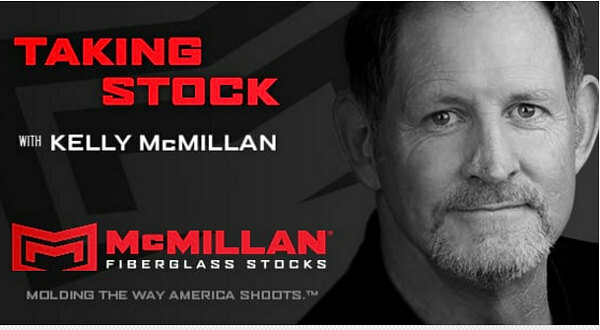 Kelly McMillan is the president of McMillan Fiberglass Stocks (MFS). This company began in 1973 whn Gale McMillan starting crafting benchrest stocks at home in his carport/garage. In 1975 MFS hired its first employee, Kelly McMillan. By 1979 Kelly was made a partner, and by 1984 Kelly was in charge of running the stock shop. Since that time MFS has continued to grow with innovation and design. Today McMillan Fiberglass Stocks has a 15,000 sq. ft. facility and 65 employees. MFS manufactures around 12,000 stocks per year, most of which are individual customers ordering one custom built stock at a time. Share the post "Ian Kelbly Guests on Kelly McMillan’s Taking Stock Radio Show"